What Should I Expect After PRK? Also known as PRK, this type of laser eye surgery can help if you are nearsighted, farsighted, or have astigmatism. It works best if your eye problem is mild or moderate. All laser vision correction surgeries work by reshaping your cornea, the clear front part of your eye. Think of it like a windshield -- light travels through it just and focuses on the retina in the back of your eye. During PRK, an eye surgeon uses a cool pulsing beam of ultraviolet light on the surface of your cornea. 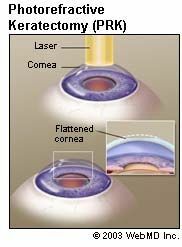 LASIK, another type of laser surgery, works underneath your cornea. It’s highly accurate in correcting many cases of nearsightedness. Most people have 20/20 or at least 20/40 vision without glasses or contact lenses one year after the surgery. Mild discomfort, including minor eye irritation and watering, for 1 to 3 days after the procedure. A longer recovery time. People who get LASIK notice improvements in less than a month. With PRK it can take 1 to3 months. You’ll have mild discomfort in the first 24 to 72 hours after surgery. You might be sensitive to light for a while, too. Within the first 6 months you might also notice that you need eyeglasses for improved vision. After that, your surgeon will answer any questions you have. Then you’ll schedule your surgery. On the day of surgery, eat a light meal before going in, and take all of your prescribed medications. Don’t wear eye makeup or bulky hair accessories that will make it hard to place your head under the laser. If you don’t feel well that morning, call the doctor's office to find out if the procedure needs to be postponed. The doctor will numb your eye with a medicine he’ll call a topical anesthetic. The surgery usually takes about 10 minutes, at most -- and that’s for both eyes. She’ll carefully remove an area of surface epithelium, or “skin,” to get to the top layer of your eye. Then she’ll use a laser to reshape it. This laser, which delivers ultraviolet light, is used on the cornea’s surface. Most of the time, the doctor will apply a bandage contact lens after surgery. You’ll wear it for the first 5 to 7 days to let the surface of your eye heal. You’ll see the eye doctor at least a few times during the next 6 months. The first visit is usually 1 day after surgery; the second vision, in which the doctor will remove the contact lens, happens about a week later. Your vision may switch from clear to blurry for the first few weeks. Until it evens out, you might need glasses to read or drive at night. Your eyes will be dry, even if they don’t feel that way. The doctor will prescribe eyedrops to prevent infection and keep your eyes moist. They might sting or blur your vision for a few seconds. Don’t use any drops your doctor hasn’t approved. Your vision will get better slowly. You should be ready to drive within 1 to 3 weeks. But you probably won’t see your best for 6 weeks to 6 months. Probably so. That’s because presbyopia (blurred reading vision but great distance vision) happens to almost everyone in their 40s. Reading glasses solve the problem. So does a process called monovision, where one eye focuses up close and the other focuses far away. You can get it with contacts or through laser refractive surgery, like LASIK or PRK. Ask your doctor if it’s right for you.